I absolutely love to find uses for old things that might otherwise end up in the trash (like the old door headboard that I posted about last week). The more I look at this photo, the more I fall in love with it. My favorite part of this design is the old bed spring that was used like a cork board. I also found the old cheese grater pencil/brush holders to be very unique. It looks like they have used an old sawed in half table to create the desk! Such a creative and green design! I love it, though I think I"m too clumsy to have a cheese grater out in the open like that. My hands would be shredded. haha. To me it looks like the desk is an old drop leaf table sawed in half. Either way, it looks great. I wish I had old cool stuff like this to build with! I pinned this the other day on Pinterest, it's so unique! I love this! 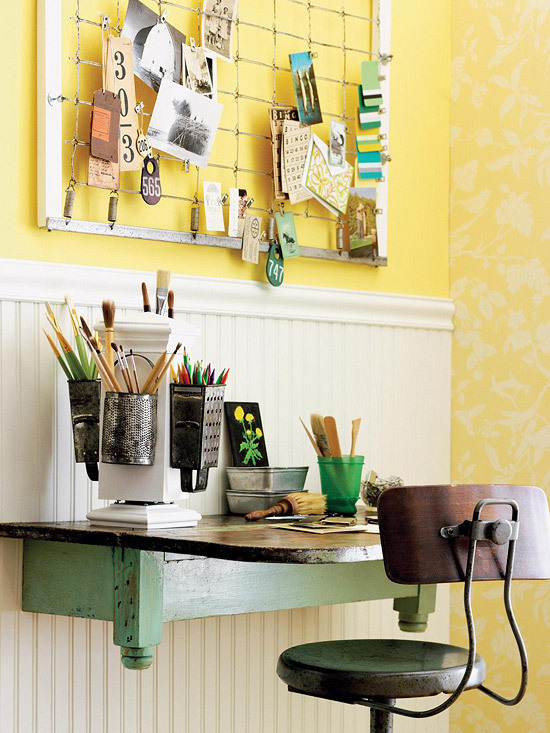 I need to re-vamp my workspace and this is quite an inspiration! I love all of the new uses for old things they found! Mel, you are absolutely right! The desk is a sawed in half table. I guess I was just thinking of beds after seeing the bed spring. Thanks for the correction! By the way, I love you blog and photography! I love the simplicity of re-purposing old household items. I would be a little weary of the cheese grater though....I would probably end up needing to re-purpose a container for band-aids too!